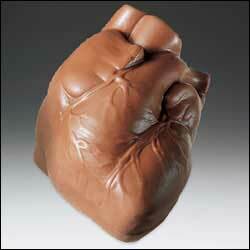 Bite into our solid milk chocolate, anatomically correct, 10 oz. human heart. Smaller than our 1lb chocolate heart, but still impressive in size and weight. Made from premium chocolate and wrapped in clear cello bag with red ribbon, it makes a great gift for your Valentine, funeral director, or cardiologist! Measures: 5.5"(L) x 3" (W) Total Weight: 10.3 oz. EXPRESS SHIPPING IS RECOMENDED DURING SUMMER MONTHS. WE DO NOT SHIP WITH DRY ICE. Please choose to order an ice pack.